Subtly elegant French olive oil... Castelas olive oil is produced in the heart of the sun drenched foothills of Les Alpilles. Castelas French olive oil is the ultimate expression of oils from Provence, France. When first inhaling, Castelas has an aroma of freshly cut grass & the olive's green fruitiness. Castelas French olive oil is unfiltered, with long-lasting exquisite notes of fresh artichokes & sweet almonds. On the finish Castelas French olive oil has a slightly peppery, bitter edge, a sign that the olives were ideally ripe when picked...and for the taste buds sheer delight! 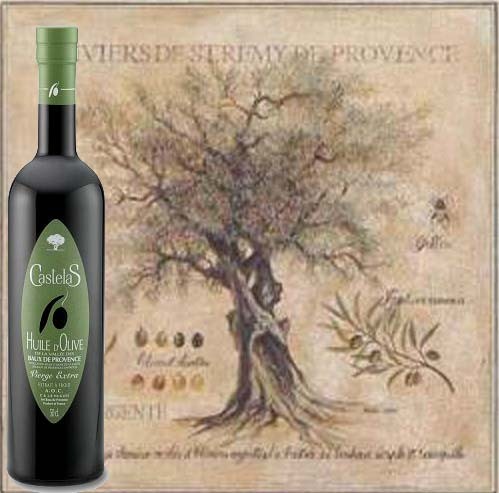 Castelas olive oil is produced from olive trees that are hundreds of years old, on 36- hectares (approximately 90 acres) in the Vallee des Baux de Provence appellation d' origine controlee ( A.O.C.) area. Olive varietals include Salonenque, Aglandau, Grossane & Verdale. Castelas French olive oil will brighten up your cooking & is best used to dress hot dishes or drizzled over grilled seafood & steamed vegetables. Dare to be different...try pairing it with a citrus salad, Enjoy an exceptional French olive oil! Castelas French Extra Virgin Olive Oil.